For enterprises and engineers, the Cisco Catalyst 6509 has been the workhorse of small and medium-sized enterprises, used for access, aggregation and core layers for years before it has been announced end of life and end of sale. Which one will be better to replace the end-of-life Catalyst 6509? Today, as virtualization and new storage arrays place greater demand on the network, engineers may find that the Cisco Nexus 5500 is a better core switch than the Cisco Catalyst 6509, specifically the Nexus 5596UP, as their network core switch. What is a viable replacement for the Catalyst 6509 that will meet growth demand for 10 GbE ports without busting the budget? Cisco’s answer is the Nexus 5596UP. Additionally, the Nexus 5596UP is a non-blocking 10GbE switch that ships with 48 fixed ports and three slots that can be populated with additional modules. In order to use the 5596UP as a core switch, engineers will have to use one of those slots with the L3 routing engine expansion card (Version 2 boosts maximum host count to 16K), while leaving two blank slots that could be filled with 16 more 10GbE ports each. 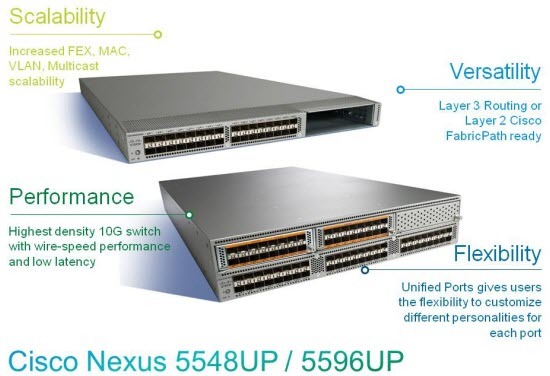 Cisco Nexus 5500, in particular, the Nexus 5596UP, may be a better choice than upgrading the Catalyst 6509 with a Supervisor 2T or a Nexus 7000. But there are design challenges to consider before investing. So in the following part we will look at Nexus 5500 design considerations that must be made prior to investing. 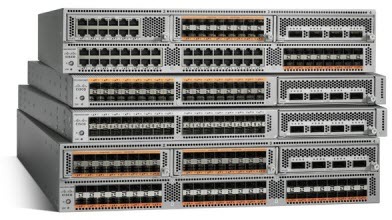 If a Cisco 6509 densely populated with 10/100/1000 copper line cards is being replaced, the Cisco Nexus 5596UP does not offer a migration path for all of those 1GbE copper ports by itself. Shops migrating from physical 1 GbE servers to 10GbE blade centers with virtual hosts will probably not see this as an obstacle, as the transition from 6509 to 5596UP can move in lock-step with the virtualization project. If 1GbE copper ports are required for the long term, Cisco offers inexpensive Fabric Extenders (FEX) that can be plumbed to either a Nexus 5K or 7K, and are bundled with optics. A FEX is not a standalone switch; it would be more correct to think of a FEX as an external line card. Note that there are differences in the FEX architectures supported between the 5K and the 7K. The 7K has been behind the 5K in FEX features and support, so check with your Cisco partner as the state of this changes as new releases of NX-OS emerge. Also note that the Nexus 7K does have a 48 port 10/100/1000 line card option, but a 7K slot is an awfully expensive bit of real estate to fill with 1GbE ports. If FEX units are in use for top-of-rack, note that only eight of them can hang off of a Nexus 5596UP with the L3 module. A 5596UP without the L3 module can handle 24 FEX. A Nexus 7K series with compatible line cards can cope with 32 FEX. This impacts shops using FEX as a part of the overall data center design, and is a unique consideration. Standalone top of rack switches (for example, the Catalyst 3750X) have no such uplink limitations. There is no redundant supervisor engine option in a Cisco Nexus 5596UP. This means that if the switch experiences a catastrophic fault, it becomes a failure point. However, a network core consisting of dual 5596UPs will presumably also have dual-homed FEX units (if they are in use), properly configured first-hop redundancy, a dynamic routing topology, and a functioning virtual port channel domain with dual-homed uplinks. These features (among others) are all recommended by Cisco in its documentation and design whitepapers as best practices to mitigate the risk of a single 5596UP going down and to make code upgrades non-disruptive. The 5596UP can’t expand port density like the 7009, which has finite expansion capabilities. Therefore, long-term demand for additional 10GbE ports will need to be considered — not that a 7K is the only choice for scaling 10GbE port density. The Nexus 5596UP switch only supports interface speeds up to 10GbE.There is no migration path to 40GbE or 100GbE in a fixed-configuration switch like this. Today, 40GbE is being used for uplinks from densely populated 10GbE switches, and is not expected to be a mainstream fixture in smaller data centers for many years. In fact, there is still some debate in the industry as to whether enterprises will skip 40GbE and go straight to 100GbE when the time comes. Therefore, 40GbE capability should probably not be part of the purchase decision, except for shops with IT hardware depreciation schedules greater than 5 years.